West Berlin, as of 1978. West Berlin was the name of the western part of Berlin between 1949 and 1990. It was the American, British, and French occupied sectors that were created in 1945. In many ways it was integrated (joined) with West Germany, but it was not a part of West Germany or East Germany. The Soviet sector became East Berlin, which East Germany claimed as its capital. The Western Allies never recognized this claim. They said that the whole city was still under four-power occupation. The building of the Berlin Wall in 1961 surrounded West Berlin. West Berlin was called "Berlin (West)" by the West Germany government, and usually German: Westberlin by the East German government. The east German spelling suggested that West Berlin was not really part of "Berlin" as a whole, but a separate place. East Berlin was officially called Berlin, Hauptstadt der DDR ("Berlin, Capital of the GDR"), or simply "Berlin," by East Germany. 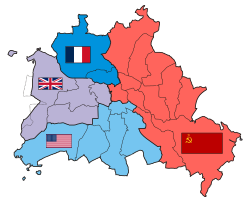 In 1948, the Soviets tried to force the western allies out of Berlin by a blockade of the western sectors. The Soviets blocked roads, railways and waterways, but the Potsdam Agreement guaranteed air corridors to Berlin. Because the western allies flew in all the supplies that normally came by land, the Berlin Blockade is also known as the Berlin Airlift. The Blockade ended in May 1949. By the end of 1949, two new states had been created out of occupied Germany - the Federal Republic of Germany (West Germany) in the West and the German Democratic Republic (East Germany) in the East - with West Berlin an enclave that was not part of either. According to the western allies, the occupation of most of Germany ended in 1949 when the Federal Republic of Germany and the German Democratic Republic were set up. But the occupation of Berlin could only be ended by a quadripartite (four power) agreement, so Berlin remained an occupied territory under the formal control of all the allies. This is why the Grundgesetz (constitution of the Federal Republic) never applied in West Berlin. The Soviets declared the occupation of East Berlin ended when East Germany was set up. This move was not recognised by the western allies who continued to view all of Berlin as a jointly occupied territory belonging to neither of the two states. There were no separate immigration regulations for West Berlin: all immigration rules for West Germany were followed in West Berlin. West German entry visas issued to visitors were stamped with "valid for entry into the Federal Republic of Germany and Berlin (West)", authorizing entry to West Berlin as well as West Germany itself. But the allies could ignore this. They technically controlled who could come into West Berlin. In 1969 U.S. military vehicles roar through rush hour traffic in the residential district of Zehlendorf, a routine reminder that West Berlin was still legally occupied by the World War II allies. But the western allies remained the ultimate political authorities there. The allies could appoint the Mayor and city government at Rathaus Schöneberg, but they never chose anyone except the elected mayor. There were differences between West Germany and West Berlin. West Berliners could not vote in federal elections; instead the West Berlin House of Representatives chose 20 non-voting delegates to the Bundestag. The West Berlin Senate sent non-voting delegates to the Bundesrat. West Berliners were exempt from the Federal Republic's compulsory military service; this meant young people moved to the city to avoid army service. Lufthansa and other West German airlines' flights could not fly to Berlin because the air corridors between West Germany and West Berlin were for UK, French or US planes only. West Berlin had its own post office, separate from West Germany's, which issued its own postage stamps until 1990. The administration was run by the West German Post Office on behalf of the allies, and stamps were marked "Deutsche Bundespost Berlin"
While West Berlin was separate from East Berlin after 1949, people could easily move between the two parts until 1961. In many ways Berlin worked as a single city. The U-Bahn and S-Bahn public transit networks, rebuilt after the war, spanned all occupation sectors. Many people lived in one half of the city and had family members, friends, and jobs in the other. As the Cold War continued, many East Germans began leaving East Germany for the West. East Germany closed the borders between East and West Germany in 1952, but did not seal off West Berlin; because there was freedom of movement between West Berlin and West Germany, Easterners could use the city as a crossing point to the West. To stop this drain, the East German government built the Berlin Wall, thus physically closing off West Berlin from East Germany, on 13 August 1961. It was still possible to travel from West Berlin to West Germany by air and by specific rail and autobahn transit routes set aside for that purpose, but inhabitants of the two Berlins were now physically and legally separated from each other. The Four Power Agreement on Berlin (September 1971) and the Transit Agreement (May 1972), helped to ease the tensions over West Berlin and made it a little easier for West Berliners to travel to East Germany and for Germans travelling along the road routes into the city instead of flying. On 9 November 1989 the wall was opened, and the two cities were once again physically - but not legally - united. German reunification soon ended the western occupation of West Berlin. On 3 October 1990 West Berlin and East Berlin were united as the city of Berlin, which then joined the Federal Republic as a state, along with the rest of East Germany. West Berlin and East Berlin thus both formally ceased to exist. ↑ No separate West German or Berlin citizenship existed; West German authorities considered the pre-war all-German citizenship continued. This page was last changed on 30 March 2019, at 15:52.